I have wandered the fascinating realms of IT, technology and software development since graduating in 1992, except for the years of running a bookstore (1996-1999). I discovered an Agile way of working through eXtreme Programming and Scrum in 2003. It became my purpose, my belief and my core; spreading the Agile paradigm to help people create better products and humanize their workplace. After a career as a consultant (2001-2013) and spending 3 years working exclusively at Scrum.org as partner to Ken Schwaber, in 2016 I decided to further my path as an independent Scrum Caretaker; a connector, writer, speaker, humanizer. I’ve come to accept the difficulty of grasping what this holds. I understand the difficulty when people offer me positions and assignments, assuming I am desperate (for money, status, work). Regardless, through my self-chosen ‘title’ I consider the areas through which to deliver value to the world, to help that world become a better place to live and to work in. “Classes“: Facilitating people’s knowledge and insights in Scrum through Professional Scrum Master and Professional Scrum Product Owner classes, and custom workshops. “Events“: Attending and speaking at events. “Writing“: Creating papers, a new book and blog notes (reproduced at some other channels). “Consulting“: Working with teams and organizations, upon the non-negotiable requirements that it must be personal, about Scrum and serious. Every activity involves plenty of hours of devising the right words and even many more hours of silent reflection, travelling mental cobblestone labyrinths. I don’t look for money for every single activity in every single service area. Context prevails. Through my work I have come to appreciate the uniqueness of every person, team, department and organisation. It has inspired me to move away from fixed approaches. (…) I don’t require specific task descriptions. I require no title. I don’t post my assignments or expose the name of your organisation, unless you explicitly allow or ask me to do so. Through the initiative of the Scrum Caretakers meetups, I see my experience confirmed that it is not easy being a Scrum Caretaker. It takes quite some intrinsic motivation, belief and dedication (a purpose) to give up (paid) time for mere collaboration on open-ended topics that rarely serve a commercial purpose. It did get me in touch with a lot of non-usuals suspects, outside of the threaded paths of ‘Agile’. The sheer beauty of that experience makes up for a lot of the sacrifices. I am gratified for the opportunities I stumbled into through my years at work. It served me well in becoming what I didn’t know I wanted (or was able) to be. Most dots only got connected in retrospect, still making it seem as if there was a plan. There wasn’t. In general I had no clue. I still haven’t. 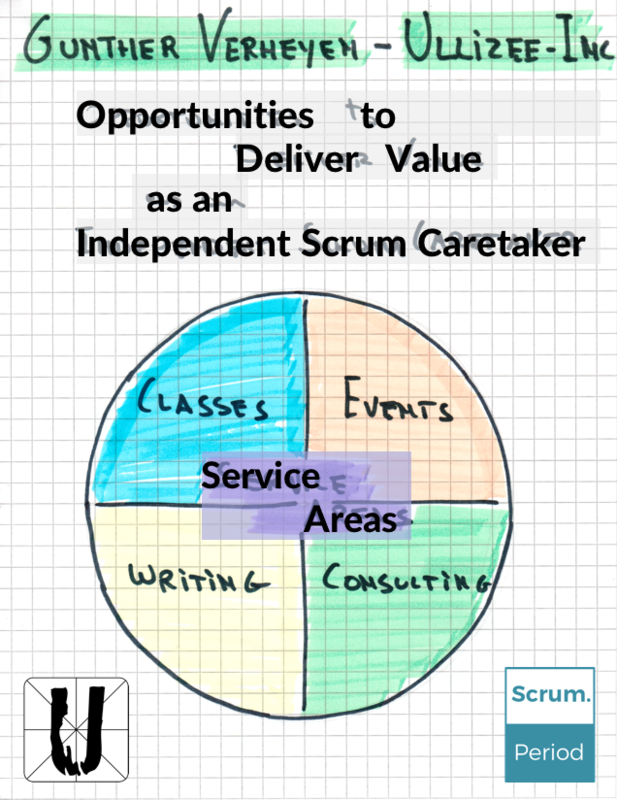 But becoming an independent Scrum Caretaker did help me shift towards creating opportunities to deliver value, and help more people deliver value. Reciprocity.